Refrigerator Vitrifrigo. Capacity: 39 l, 3.6 l freezer compartment, Power: 12/24 V 50Hz, Power absorption: 31 W, Panel front door, Reversible opening and vent position. Weight: 17 kg. Refrigerator Vitrifrigo. Capacity: 42 l, 3.6 l freezer compartment, Power: 12/24 V 50 Hz, Power absorption: 31 W, Panel front door. The newest materials and applications provide an increase in the refrigerators insulation values without affecting dimensions. Vitrifrigo uses, in it`s products, only certified compressors which pass the highest quality sound test levels. Refrigerator Vitrifrigo. Capacity: 92 l, 12.8 freezer compartment, Power: 12/24 V 50 Hz, Power absorption: 45 W, Panel front door, Reversible opening and vent position. Refrigerator Vitrifrigo. Capacity: 115 l, 17.1 freezer compartment, Power: 12/24 V 50 Hz, Power absorption: 45 W. Stainless steel front door. Vitrifrigo refrigerator. 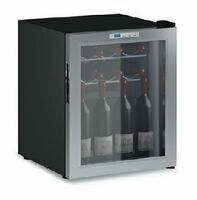 Capacity: 133 l. Airlock system, Black or Grey door, external cooling unit, Power: 12/24 V.
Winecellar for 12 bottles. The temperature settings are adjusted by digital thermostat (from +4 to +18 degrees). Darkened door glass (protection against UV) and brushed stainless steel finish. Power supply: 220/230 V, 50-60 Hz. 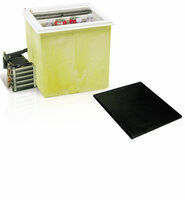 Power absorption: 85 W, consumption: 0.65 kW/24 h. Capacity: 58 l. Dimensions: 470 x 430 x 520 mm. Vitrifrigo, 37 l top loading refrigerator, Power: 12/24 V. All 12/24 V models are available, except SeaDrawer IM and Icemaker also with dual electronic control: 12/24 V or 100/240 V 50/60 Hz. Vitrifrigo top loading refrigerator, Capacity: 40 l, Power: 12/24 V. Top loading refrigerators with a thermoformed plastic interior, suitable for built-in installations. 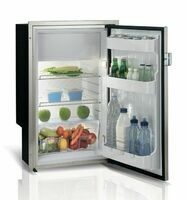 Vitrifrigo top loading refrigerator. Capacity: 160 l. Power: 12/24 V.
Vitrifrigo top loading freezer. Capacity: 160 l. Power: 12/24 V.
Rigid Igloo Polar icebox. Dimensions: 98 x 44 x 45 cm, Capacity: 114 l. Drain plug. Plastic lock. Ice retention days at 32 °C external temperature - 5 days. Weight: 12.7 kg. Available also additional cushion (Product code 50.566.92) for request. Rigid Igloo Quick & Cool icebox. Dimensions: 90 x 45 x 43 cm, Capacity: 95 l. Drain plug. Plastic lock. Ice retention days at 32 °C external temperature - 5 days. Weight: 8.6 kg. Available also additional cushion (Product code 50.566.90) for request. Rigid Igloo Marine Ultra icebox. Dimensions: 60 x 35 x 33 cm, Capacity: 34 l. Drain plug. Plastic lock. Ice retention days at 32 °C external temperature - 5 days. Weight: 3,6 kg. Available also additional cushion (Product code 50.566.92) for request. Rigid Igloo Marine Ultra icebox. Dimensions: 65 x 39 x 39 cm, Capacity: 51 l. Drain plug. Plastic lock. Ice retention days at 32 °C external temperature - 4 days. Weight: 5.2 kg. Reinforced hinges. S/S lock, UV protection. 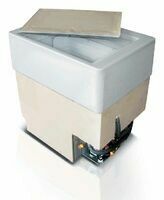 Rigid Igloo Marine Ultra icebox. Dimensions: 75 x 42 x 42 cm, Capacity: 68 l. Drain plug. Plastic lock. Ice retention days at 32 °C external temperature - 5 days. Weight: 7.2 kg. Reinforced hinges. S/S lock, UV protection. Available also additional cushion (Product code 50.566.80) for request. Portable refrigerator Vitrifrigo. Capacity: 65 l, power consumption 55 W, internal temperature range +10°C / -22°C, net weight 23 kg. Features: control panel, detachable lid, internal LED light, dual power (12/24 Vds-100/240 Vac), removable basket, digital thermostat. Portable refrigerator Vitrifrigo. Capacity: 55 l, power consumption 55 W, internal temperature range +10°C / -22°C, net weight 22 kg. Features: control panel, detachable lid, internal LED light, dual power (12/24 Vds-100/240 Vac), removable basket, digital thermostat. Portable refrigerator Vitrifrigo. Capacity: 45 l, power consumption 55 W, internal temperature range +10°C / -22°C, net weight 20,5 kg. Features: control panel, detachable lid, internal LED light, dual power (12/24 Vds-100/240 Vac), removable basket, digital thermostat. Portable refrigerator Vitrifrigo. Capacity: 35 l, power consumption 55 W, internal temperature range +10°C / -22°C, net weight 19,5 kg. Features: control panel, detachable lid, internal LED light, dual power (12/24 Vds-100/240 Vac), removable basket, digital thermostat. Portable refrigerator Vitrifrigo. Capacity: 16 l , power consumption 45 W, internal temperature range +10°C / -18°C, net weight 8 kg. Features: control panel, detachable lid, internal LED light, dual power (12/24 Vds-100/240 Vac), removable basket, digital thermostat. Isotemp boiler with internal tank, coil and stainless steel external cover. The tank has a 5-year warranty against leaks. Operation with 750 W 220 V nickel-plated copper resistance, or with heat exchanger connected to the engine cooling system. The resistance is positioned on the lower part of the boiler to avoid heat stratification. Fitted with double safety thermostat, 4-bar safety valve with check valve that reduces or blocks water leakage by expansion. Polyurethane foam insulation, horizontal or vertical installation. Thermostatic mixer already installed. Dimensions, 505 x 295 mm, Max.Pressure: 6 bar. Volume: 15 l. Weight: 8 kg. Isotemp boiler with internal tank, coil and stainless steel external cover. The tank has a 5-year warranty against leaks. Operation with 750 W 220 V nickel-plated copper resistance, or with heat exchanger connected to the engine cooling system. The resistance is positioned on the lower part of the boiler to avoid heat stratification. Fitted with double safety thermostat, 4-bar safety valve with check valve that reduces or blocks water leakage by expansion. Polyurethane foam insulation, horizontal or vertical installation. Thermostatic mixer already installed. Dimensions: 630 x 295 mm, Max.Pressure: 6 bar. Volume: 20 l. Weight: 9 kg. Isotemp boiler with internal tank, coil and stainless steel external cover. The tank has a 5-year warranty against leaks. Operation with 750 W 220 V nickel-plated copper resistance, or with heat exchanger connected to the engine cooling system. The resistance is positioned on the lower part of the boiler to avoid heat stratification. Fitted with double safety thermostat, 4-bar safety valve with check valve that reduces or blocks water leakage by expansion. Polyurethane foam insulation, horizontal or vertical installation. Thermostatic mixer already installed. Dimensions: 460 x 395 mm, Max.Pressure: 6 bar. Volume: 24 l. Weight: 11 kg. Isotemp boiler with internal tank, coil and stainless steel external cover. The tank has a 5-year warranty against leaks. Operation with 750 W 220 V nickel-plated copper resistance, or with heat exchanger connected to the engine cooling system. The resistance is positioned on the lower part of the boiler to avoid heat stratification. Fitted with double safety thermostat, 4-bar safety valve with check valve that reduces or blocks water leakage by expansion. Polyurethane foam insulation, horizontal or vertical installation. Thermostatic mixer already installed. Dimensions: 630 x 395 mm, Max.Pressure: 6 bar. Volume: 40 l. Weight: 17 kg. Isotemp boiler with internal tank, coil and stainless steel external cover. The tank has a 5-year warranty against leaks. Operation with 750 W 220 V nickel-plated copper resistance, or with heat exchanger connected to the engine cooling system. The resistance is positioned on the lower part of the boiler to avoid heat stratification. Fitted with double safety thermostat, 4-bar safety valve with check valve that reduces or blocks water leakage by expansion. Polyurethane foam insulation, horizontal or vertical installation. Thermostatic mixer already installed. Dimensions: 750 x 395 mm, Max.Pressure: 6 bar. 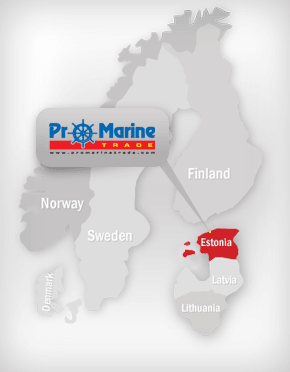 Volume: 50 l. Weight: 20 kg. Gas burners with stainless steel sink. Model C. Cooktop taps, fitted with pot holder. External dimensions: 49 x 46 cm, sink: 24 x 34 cm. Basin: Right version. Added picture - left version. Gas burners with stainless steel sink. Model C. Cooktop taps, fitted with pot holder. External dimensions: 49 x 46 cm, sink: 24 x 34 cm. Basin: Left version. Stainless steel flush mount hob units. Extra compact, fitted with safety thermocouples and pot holder.Outside dimensions: 320 x 285 mm, Overhang (internal): 30 mm, Overhang (external): 80 mm. Burner: 1750 W. Optional: Pot holder (product code 50.100.48). Stainless steel flush mount hob units. Extra compact, fitted with safety thermocouples and pot holder. Outside dimensions: 350 x 320 mm, Overhang (internal): 30 mm, Overhang (external): 80 mm. Burners: 2 x 1750 W. Optional: Pot holder (product code 50.100.49). Stainless steel flush mount hob units. Extra compact, fitted with safety thermocouples and pot holder. Outside dimensions: 470 x 360 mm, Overhang (internal): 30 mm, Overhang (external): 80 mm. Burners: 1000 W, 1750 W, 3000 W. Optional: Pot holder (product code 50.100.50).